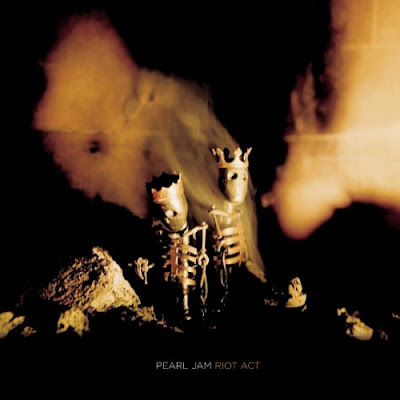 I Am Mine is, in my estimation, one of Pearl Jam’s most important songs—one of their ‘mission statement’ pieces that really encapsulates what the band is about, the dogged, stubborn hope that is at the core of their best music. It’s the relative absence of that hope on Riot Act that makes it such a challenging (and perhaps ultimately unsuccessful) record. I am Mine IS a hopeful song, the most important ray of tarnished light in an otherwise dim and shadowy collection of songs, especially given the way it ends. Musically the song is introspective (especially the way the keys anchor the song) but it’s questing, rather than wondering. The song is trying to recover, rather than discover, the truth of the singer’s existence. As such there is an edge to it, a sturdy confidence underneath a fragile veneer. This is, I think, the musical highlight of the album. No other song on this record is quite as rich, has quite as much depth, or is as powerful musically, as I Am Mine. Vocally I think this is also the strongest moment on the record. Again Eddie seems withdrawn and self-centered, rather than expansive, but in this song he sounds like he’s advancing, rather than retreating—ascending out of the darkness instead of descending from the light. The song isn’t exactly a call to arms, at least, not until the very end. Instead it is about marshalling the strength needed to fight the battle to come. I am Mine is the journey someone needs to take in order to defend the convictions advanced in Love Boat Captain. Lyrically I Am Mine is a mixed bag, with some lyrics that come across as weightier than they really are alongside some quite excellent writing. The song beginss with the singer taking stock of the world around him, and the people inhabiting it. What is most striking about the first two verses is the sense of powerlessness and insignificance that characterizes people’s lives. There is no agency here, no sense that we can control, or even understand, the lives we’re forced to live. You can read the senseless tragedy of Rosklide into this, or the paralysis any decent citizen had to have felt under Bush, but in either way we face a world too big, too impersonal, and seemingly without justice or meaning (the first two lyrics of the second verse try, unsuccessfully I think, to convey this) for us to master, and too often we find that in the face of our own insignificance the best we can do is surrender and hope for mercy (and maybe privilege). This is the meaning of the first two sets of line (the selfish, they’re all standing in line/faithing and hoping to buy themselves time). They’re selfish, but it is a selfish born of powerlessness, the result of being forced to live in a world where, to paraphrase Eleanor Roosevelt, we have to hope for privilege because we cannot count on justice. The third verse only ratchets up the tension, our sense of powerlessness and isolation, in language far more powerful than the first two verses. The ocean is full because everyone’s crying, and yet in our misery we turn away from each other rather than towards each other, and our isolation is what traps us—in a world in which solidarity is impossible justice is impossible, and our lives will remain lonely and incomplete. So I Am Mine, like all of PJ’s best music, is about trying to build that solidarity. And, as always, that fight begins inside the self. We begin by mastering ourselves, our own sense of insignificance and our own fears of both our powerlessness AND our power—that by declaring ourselves willing to fight, willing to resist, taking responsibility for our own lives, we have the chance to rebuild the world, to begin again. We don’t need the certainty of victory—the meaning comes from the struggle. These are the ideas that Eddie concludes each verse with (As each breath goes by I only own my mind, I only know my mind, I know I was born and I know that I’ll die, the in-between is mine). The one thing that can never be taken away from us is our sense of self, and that is a powerful base from which we can begin to rebuild a new and better world provided we embrace it, since we can only really begin to love one another, and through that love heal the world we live in, when we first come to know and love ourselves. This plays itself out through the magnificently written chorus, with its subtle shifts in meaning and allusions to Rosklide, 9-11, or whatever personal tragedy the listener needs to invest the song with to find meaning. In the face of tragedy it is easy to lose the self-confidence, the connections to other human beings, that give our life substance and direction. While our world collapses around us I Am Mine urges us to look behind our eyes, deep into ourselves, to find the strength we need to endure. It implores us that there is no need to hide, that we’re safe, that we are in control, as long as we can tap that strength. As the song approaches its climax Eddie tries to bring I Am Mine back down into the murk that so much of the rest of the record inhabits, but it he does so only so he can dismiss it—that we will endure in the face of the lying, the lost innocence, that we steadfastly will refuse to let Bush, to let the world, break what is most valuable, most precious, most human within us. We may need to hide, but we don’t have to, we don’t need to, as long as we cling to ourselves, and through ourselves, each other. And I Am Mine ends with a gloriously cathartic release, one of the most powerful musical moments in their catalogue with Mike’s gorgeous solo rising out of the shadows and dust reaching towards the promise of that distant, better world. The band could have built off of this. If they chose to end with I Am Mine instead of All or None the record saves itself—it meets the political, social, and existential crisis of Bush’s America and triumphs over it. Had they gone on to include Down and Undone after I Am Mine it redeems the optimistic potential interpretations of so many of the other songs on the record. But those songs weren’t included because they didn’t fit the ‘feel’ of the record, and this isn’t a musical fit they were concerned about. Down and Undone work perfectly well in that regard. The problem is thematic. They are rays of light and hope in a record that turns away from them—they represent a faith that the songs cling to, but no longer believe. I Am Mine is all the more poignant for its failure—it strives for so much, and cannot ultimately get there.